Lately, we have been walking through some big moments in our home. Our fellas have been taking bold steps outside of their comfort zones. But with each step to try something new sometimes comes with the disappointment of things not going quite the way they planned. Seeing the disappointment on their faces, everything in me wanted to fix their hurt. As much as I want to save them from their disappointment, protecting them from their pain would only hinder their growth into strong, Godly men. Because I know what it’s like to deal with disappointment. It hurts. It’s uncomfortable. Sometimes, it’s just HARD. But I also know on the other side of disappointment can be victory, success, and strength. As parents, one of our responsibilities is equipping our fellas with the necessary skills to cope when disappointment happens and then teaching them how to navigate through these moments in a healthy way. Now I am still walking through the teaching phases with our fellas, so these skills are ones we are working through on a daily basis. Experiencing disappointment is real for everyone at all ages and all stages of life. We don’t outgrow it. We can’t avoid it. When our children are letdown, first begin by acknowledging their perception of what happened. Teaching children to recognize their emotions and respond in healthy ways encourages them to be resilient. The disappointment our children face in the moment is real to them. As parents, let’s listen to what they have to say without interruption, without ridicule, and without judgment. Our children don’t need us to validate their emotions; they need us to acknowledge they exist. Remember, our children learn how to navigate disappointment by what we teach AND what we model. So, don’t be afraid to relate. Share how you have walked through disappointment in your own life in friendships, in relationships, or plans being changed. Share what strategies work for you. Our children need to know they are not alone in their emotions. When disappointments happen, it’s important our children have techniques to help them to process their emotions in a healthy way. Presence: Sometimes our children don’t need words, they need presence. Offering a hug or even sitting beside your child shoulder to shoulder on the floor communicates you care and his/her feelings matter. Just being there speaks louder than any words. Exercise: Go for a walk with your kid. Play a game. Do something that encourages your child to see beyond their frustration and even have some fun. Talk in a safe space: All children need to be to talk freely about their emotions and experiences. They need to be heard. As much as you want to fix things, listen. Listen to music: Help your child identify types of music or particular songs that make them feel calm and peaceful. Playing upbeat songs or praise and worship music can have a positive impact on their emotional state. Draw: Drawing or any artwork will allow the child to process what he/she cannot put into words. Create: Whether it is cooking, working with clay, or building fort, spending time creating can help your child release pent-up energy and frustrations from their disappointment. Prayer: Take time to pray over your child out loud. Lead your child in prayer for guidance and peace. Teach your child how to pray when faced with disappointment. In doing this while our children are young, we help model how to pray when they are older. Scripture: Teaching our children scripture ahead of time will comfort them when they go through difficult times. Create scripture cards together your child can go to when he/she is dealing with different emotions. These cards will keep them rooted in the word when their world starts to spin. Once we help our children acknowledge their disappointment and teach them self-regulating techniques, then the next practical step is helping them see the good. In every disappointment, there is some good. As parents, we can help them stretch their perspective. Sure, your kid didn’t make the basketball team, but he did step out of his comfort zone to try out. Okay, your daughter didn’t get a part in the school play, but she did face her fear of public speaking. The good is in stepping out, facing fears, and being willing to do something bold or different. How can you improve for next time? How were you strong, bold, or brave? When these disappointments happen, we can teach our children “nevertheless” statements. These statements acknowledge the disappointment while also equipping them to see the good. I am disappointed I didn’t make the team; nevertheless I know I did my best. I am disappointed I wasn’t invited to the party; nevertheless, I know I am loved. I am disappointed I didn’t make an A on my test; nevertheless I know I worked hard. By refraining their thought process, we teach our children how to exercise self-control over their emotions. Our children don’t need us to protect them from disappointment; rather they need to be pointed to the protector of their hearts Jesus Christ. By equipping our children with the skills to cope with disappointment, we are providing them with the resources to walk through life’s challenges with resilience. How do you help your kid deal with disappointment? Share your comments below. Thank you for this post. It is so hard to watch our kids be disappointed but I trust God is using each instance to build character. I love the point to simply acknowledge their feelings and give them ways to cope. I’m a ‘fixer’ so often want to get right past the feelings to the hope but I can do it so fast they miss the opportunity to figure out how to do it themselves. Plus, feelings take time! I love this post. I think so many times we have a desire to FIX their disappointment, when it’s a feeling that they need to experience and learn to truly feel and manage. You are so right Melisa. That desire to fix it is so real. It takes a lot of discipline to walk them through it instead of stepping in to fix it. As a former elementary teacher, what great advice you are giving! I currently am working on helping my three year old name his emotions and figure out ways to help him calm down. Sometimes a hug does the trick, and other times he uses a strategy from preschool by putting his hands at his sides in fists when mad. Thanks for sharing this post. This is great! We can all use advice on how to handle those difficult conversations with our children. Thanks for sharing! How do you handle hard talks? Any suggestions? This is something I can put into practice with my niece and nephew. My daughter is only 4 months old right now. I think that many times I have gotten frustrated with kids when they are disappointed rather than trying to understand their feelings and help them understand their feelings. Great article. You are not the only one Ryan. It helps me to remember how challenging disappointments can be for me NOW. This is such a good parenting guide. I love how real, intuitive and applicable these items are. Disappointment is part of life and teaching our child its reality and letting them see the positive side is one of the greatest thing that we can teach them as parents. I agree! They need our help to guide them through these moments. I love this! I think these concepts are incredibly important and can be very difficult for us parents! Disappointment is inevitable and being able to manage it effectively is so important! Sometimes teaching how to deal with disappointment to our kids is hard for us because we are still working it out too. But we can still have the conversation and allow ourselves to let our children see our vulnerability. I love your thoughts on this. Our end goal is to raise resilient children, so it’s up to us as parents to provide guidance on how to handle those tough moments. There is so much to be learned from disappointing moments. Yes there is Sonja! These moments will happen. Helping our children know what to do when the hard moments come is up to us. Time will come that my child will grow, this is a very good read! It helps young moms like me not to have so much fear on raising our kids! Oh, yes!! We can start using these strategies early. Children can experience disappointment early even in small ways. This is so beautifully said! 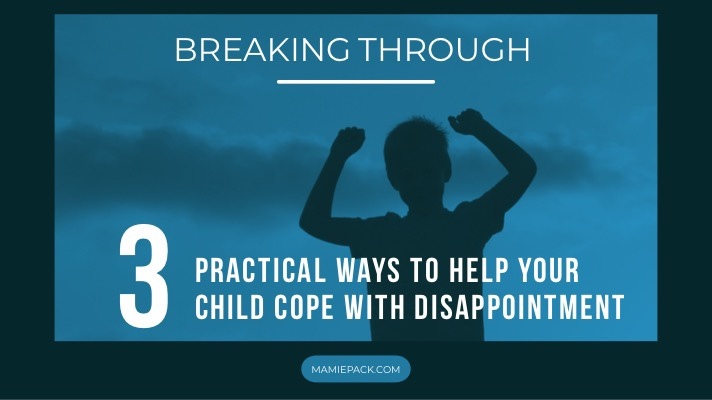 We can’t protect our kids from disappointment so it’s imperative that we equip them with the ability to cope. Absolutely! The sooner we start helping them the better. Do you use any of these strategies? These are wonderful tools! My oldest purs herself out there to try everything and the disappointment is very difficult! Oh, it is Stacey. As a parent you are so proud of them for trying something new, but it is hard to see them hurt when they deal with the disappointment.